Many of the conclusions of our work are to be called surprising and contrarily to what mainstream says in scientific disciplines as archaeology and geology. surprising and contrarily to what mainstream says in scientific disciplines as archaeology and geology. If Alfredo was right, we will have to review official history. Many conclusions will seem extreme, as most of us are used to another story. But as you will see here, most of the ancient mysteries can't be explained with the official versions! 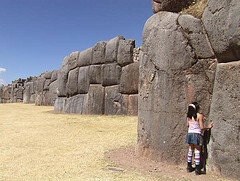 Official science says the vestiges near Cusco are from the Inca time and not older. Further reading makes it clear that no good explanations are offered to explain the splendid stone work. It is very hard to believe that the Incas did it all by hand, even if they used the labour of thousands of people. One thing is to transport the giant stones of for example Sacsayhuaman, just above Cusco, another thing is fitting them perfectly together. But depending on which guide you get on the tour to the vestige, you can hear different stories. Going from one extreme to another, as are: 'this is the work of extraterrestials', or: the Incas had some liquid that could dissolve stone. Both have not been proven in practice. 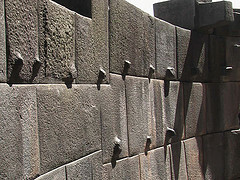 Archeological phenomena of stonework in Cusco, Sacsayhuman, Machu Picchu, the Sacred Valey and more. The basis and most concrete visual evidence of Alfredo Gamarra's theory. About the different styles that exist in all vestiges and how to interpretate them. The relation with three different periods that humanity went through. The disappearance of ancient cultures as Atlantis, the ancient mysteries of the great similarities between other places in the world as Egypt, Stonehenge, Japan (Yonaguni), Easter islands and many other Megalithic and Monolithic places. The geological and cosmological explanations of a smaller world in earlier times with hard to deny evidences. A mystery to official science, where geologist prefer to theorize on subduction (which does not exist! ), all based on the wrong assumption of an earth with a constant size and orbit. The extinction of dinosaurs and other giant species of flora and fauna, and the pattern of earth increasing in size and mass through time. The origin of religion, the existence of Gods and Giants with supernatural capacities in all cultures. Ancient mysteries of the Bible. The pattern of an earth that goes from smaller to bigger in time, we can find back in human history, in the bible and in the myths and legends of all cultures. Other calendars with less days per year, that existed in the past. Earth was smaller in the past. Earth went through different periods corresponding to different orbits of earth around the sun, with, of course, different calendars. Life was bigger in the past thanks to less gravity. Humanity could live longer thanks to less gravity. Monolithic and Megalithic constructions were easier to construct thanks to less gravity. Construction of these monuments was done with moldable stones. The precision of the perfect fitting stones was thanks to the stones being moldable on the moment of construction. The vestiges of Cusco and surroundings are much older than 'Inca time'. Cusco was Babylon 'the Great'. Atlantis existed in an earlier orbit, so South America, especially Cusco and surroundings, were an important part of it. Too much for you? Unbelievable? Come and see the reasons how Alfredo Gamarra came to these conclusions! The DVD The Cosmogony of the 3 Worlds is a first and important step on the road to documenting his complete investigations. If you like untraditional viewpoints and unorthodox thinking about ancient mysteries, you are defintely in the right place! And you will be able to gain a whole new perspective on ancient history. This website will also be a continuing source of new information on ancient mysteries and about new productions of Alfredo Gamarra's work. So keep checking this webpage! Or if you like, subscribe to the Newsletter 'Ancient Mysteries Explained', so you will be the first to read! As a courtesy you will then be able to download the E-book "The Discoveries of Alfredo Gamarra", which gives you a nice overview of all his ideas and discoveries. Yes, Send Me The Free Newsletter 'Ancient Mysteries Explained and let me download the E-book "The Discoveries of Alfredo Gamarra"'! Yes, Send Me The Free Newsletter 'Ancient Mysteries Explained'!